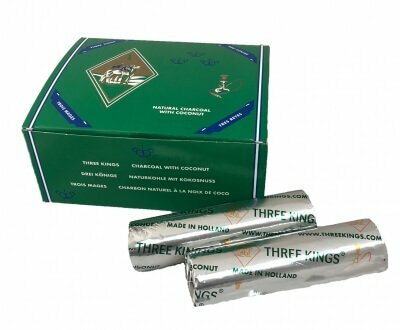 Three Kings Charcoal is the most famous quick lighting hookah charcoal worldwide. With their expertise in high quality charcoal production, they have launched their efforts into the natural non quick lighting coconut hookah charcoal market. Proudly introducing Three Kings Coconut Hookah Charcoal, the worlds first natural non quick lighting coconut hookah coal that is manufactured in Holland and compressed into round 33mm tablets. Let Three Kings Charcoal Company impress you with their version of quality coconut charcoal, now in a natural and non quick lighting form. Each roll of Three Kings Coconut Charcoal contains ten individual charcoals and each box of Three Kings Coconut Charcoal contains ten rolls of charcoal. It is recommended that three rolls of Charcoals be purchased for every 250g Box of Herbal Shisha. These are Non Quick Light shisha coals for hookah pipes that can be lit with an open stove flame. Three Kings supplies your hookahs with 40-50 minutes of burn time per coal. Three Kings manufactures their natural coconut non quick lighting charcoal product in Holland. If you have any questions about this product by Three Kings Coconut, contact us by completing and submitting the form below. If you are looking for a specif part number, please include it with your message.